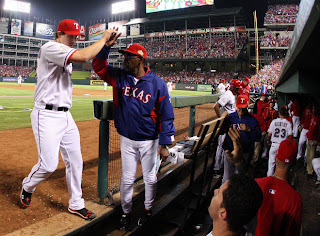 Well the 2011 World Series is all knotted up at two games following a sterling pitching performance from Rangers starter Derek Holland last night. Now as the series has one more game left in Arlington before it shifts back to the Cardinals' home in St. Louis, who needs to win game five more? This is certainly a pretty even series in my opinion as neither of these clubs seems to have a serious edge over their opponents. And that makes game five tonight crucial. And I think the Rangers need it more. If the Cardinals take game five tonight, they will have the momentum to close out the series in six at home on Wednesday evening. As I've noted before, if you can win the game on the road right before you head back home, it's huge momentum-wise. Obviously who ever wins tonight will be able to close out the series in game six but if the Cardinals won you'd have to give them the huge advantage as they will be in front of the home fans. Granted I feel pretty certain that this series will go a full slate of seven games but it will be up to the two aces, Chris Carpenter for St. Louis and C.J. Wilson for Texas, tonight to determine who will be in position to take the series on Wednesday.